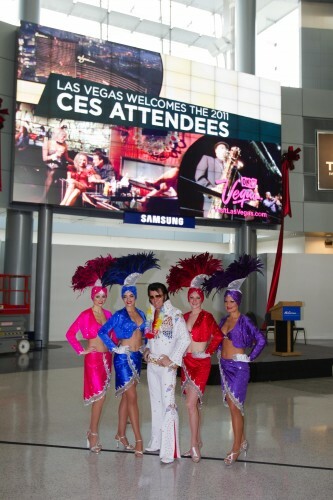 In preparation for the 2011 International Consumer Electronics Show, which will be held in Las Vegas January 6-9, McCarran International Airport partnered up with Samsung Electronics America to install a giant 100-screen video wall in the airport’s D Concourse. There are also smaller, 10-screen displays on the A, B and C Concourses. Until something bigger comes along, the 33-foot-by-19-foot screen may be the largest-known video wall in a U.S. airport. Big enough, airport officials hope, to make it into the Guinness Book of World Records. Or maybe they could show videos of all those old Elvis movies. Stay at Sting’s, Cook where Julia cooked?